2011 marked David’s 34th year as a full time professional musician and his 48th year associated with the entertainment and hospitality industries. It also marked his 16th year as a member of The Blackpool Tower Ballroom resident organists team. David has been playing organ and piano ever since he completed his apprenticeship as a pipe organ builder with Hill, Norman & Beard in 1977. In that year he emigrated to Canada and played organ in a number of venues including ice hockey stadia and circuses. On his return to the UK in 1988 David had a number of different jobs including Resident Organist at ‘The Bygone Village’, Musical Director for the ‘Gerry Cottles Circus’ and show/keyboard player and cocktail pianist on a cruise ship. 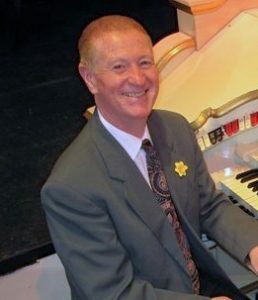 In 1992 he joined the team of organists at the Blackpool Tower playing the famous Wurlitzer.